Do you ever wonder if you’re making the best use of your SEO tools? Most tools that have been around a while have so many features and capabilities that it’s easy to lose track of them all, and just stick with the way you’ve used them since the beginning. I confess, when it comes to Majestic, I’m one of those users that rarely ventures beyond the beaten path. I have a few standard reports that I run to get the data I need from Majestic, and that’s it. But tools like Majestic have so many extra features that are rarely used, and I pay for them all with my subscription. It’s a shame to waste all those powerful features, simply because I don’t know they exist and I don’t understand what they could be useful for. The folks at Majestic have now rolled out a new feature that hopes to change all this: They’ve basically turned the entire Majestic suite of tools in to one big game, where you can win awards for simply using all the various different features that their platform has to offer. 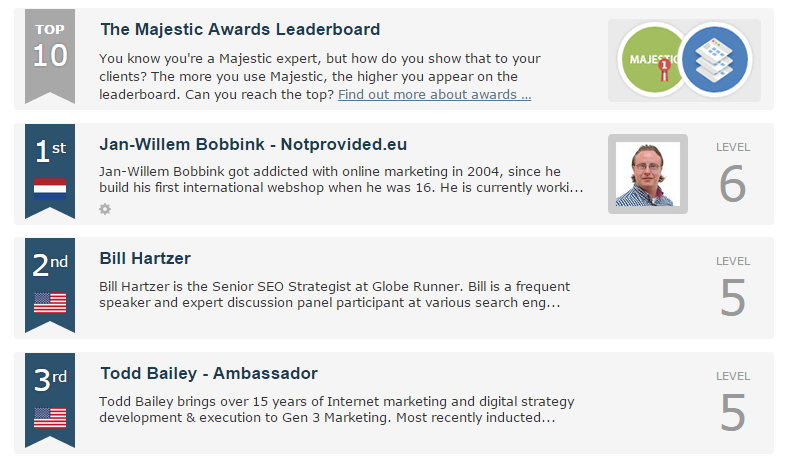 Whenever you use one of Majestic’s features, you’ll get closer to winning the award for that category of tools. 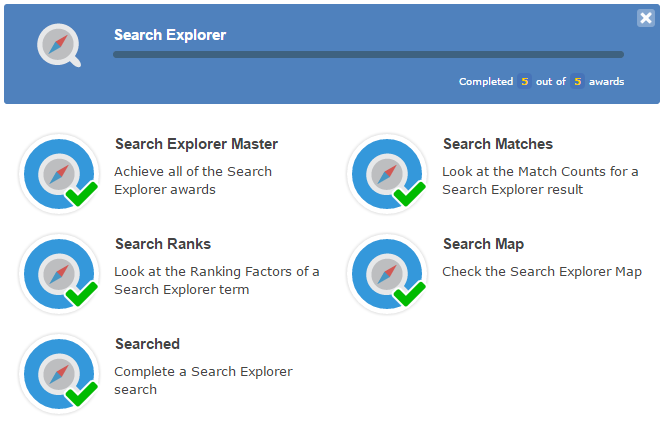 For example, if I were to use all the different features of the Search Explorer, I will then earn the relevant award. I am, by the way, entirely unsurprised that State of Digital blogger Jan-Willem Bobbink is at the top of the leaderboard right now. That man is a SEO data geek of the highest level. 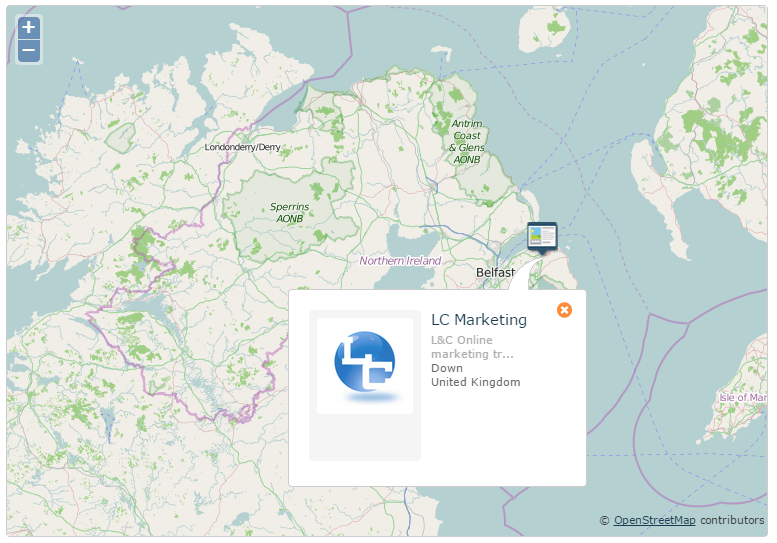 Hmm, one agency listed in Northern Ireland. I better get my finger out and make sure my account is top there. This gamification feature is pretty cool and gives you a fun incentive to explore all that Majestic has to offer, with a strong likelihood that you’ll start using some of the more obscure features regularly. And if you’re good enough you can show off your proficiency and earn virtual kudos, standing out among Majestic’s users as a true expert. So not only will you earn virtual kudos, by winning awards you’re also helping make Majestic a better product. One of the tricker awards to earn will be the Events category. I’ll be collecting my first one there this Friday at BrightonSEO! 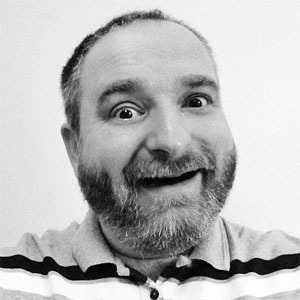 Barry Adams is one of the editors of State of Digital and is an award-winning SEO consultant based in Belfast, delivering specialised SEO services to clients across Europe.